Mailboxes, Drop Boxes, Mailbox Locks - Locksmiths & Safemen Security Hardware Ltd.
RIOPEL 6400 FRONT LOADING- ACCESS TO THE COMPARTMENTS FOR LOADING IS FROM THE FRONT THROUGH A HINGED MASTER DOOR. THE 6400 HAVE A SECURE ALL-POINT LOCKINBAR PREPARED FOR THE POST OFFICE LOCK PROVIDING TAMPER PROOF AND VANDAL RESISTANT BOXES. COMPARTMENTS MADE FROM WEATHER RESISTANT GALVANIZED METAL. 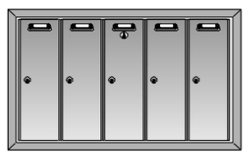 CONFIGURATIONS: AVAILABLE IN MODULES 4 COMPARTMENT HIGH X 3 WIDE TO 8 HIGH X 6 WIDE. INSTALLATION: WALLMOUNT (MODEL 6100) HAS REINFORCED BACK AND COMES WITH WALL BRACKET AND HEAVY DUTY BASE PLATE TO ATTACH TO WALL. 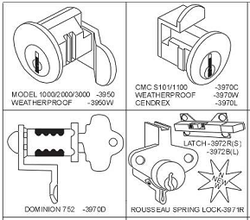 DOOR LOCK: 5 PIN CYLINDER TYPE WITH SPRING LOADED STAINLESS STEEL WEATHER SHIELD WITH TWO KEYS EACH. 1000 KEY CHANGES TO AVOID DUPLICATION. OPERATION: Front loading with pivoting section for mailman. Control lock supplied and installed by Post Office. 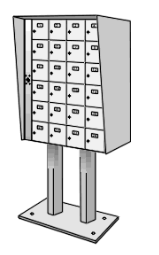 SECURITY: Inter-locking brackets to prohibit prying, keeping mail safe. COMPARTMENTS: Modules of 1 to 8 compartments. 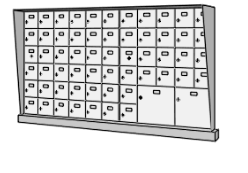 15-3/4” (400) H x 5-1/8” (130) W x 6-1/4”(159) D. Also 10-1/4” (260) W.
OPTIONS: Bell buttons, directory panels, parcel doors and letter/card slots. Padlockable doors. FOR APARTMENT HOUSES, CONDOMINIUMS, MULTI HOUSING, OFFICES, ETC. Box made from high strength sheet steel with spot-welded assembly, primed and painted silver grey. Box interior 18”H x 13-1/2”W x 8” D. Slot is 10” Wide x ¾” High with flap. Door has dust cover cam lock for private use or prepared for Post Office Lock.